January 2019: Leslie receives 2 gold medals, 2 silvers, and honorable mention in 2018 NATJA Travel Media Awards Competition. “The Couple in Trouble” published in Outside Magazine won gold in the Destination Travel online, “A Guilt-Free Day on the Slopes: One adventurous family’s guide to the latest in ecofriendly snowboarding gear” originally published in Sierra Magazine won gold in Eco, Environmental or Volunteer Travel, “The Couple in Trouble” published in Outside Magazine won silver in Health and Wellness Travel, “Snags” originally published in Panorama Journal of Intelligent Travel won silver in Cultural Travel online,“Snags” originally published in Panorama Journal of Intelligent Travel won Honorable Mention in Long-Form Narrative category. January 14, 2019: Leslie receives Individual Artist Fellowship Established Professional Award from Delaware Division of the Arts. September 19, 2018: “What to Expect When You’re Expecting” published in Taste by Naomi Tomky includes an interview with Leslie. July 13, 2018: Leslie is speaking with Phillappa Biddle about ethics in her photography and writing at Impact Travel Immersion conference in New York. July 7, 2018: Leslie is reading her short story from Grace in Darkness in Rockville, Maryland. Contact Leslie for details. June 22, 2018: “The Best National Parks for Kids” published in Outside Magazine. May 7, 2018: “On the Line” short story published in Grace in Darkness anthology. March 2018: K’e yil yal tx’i: Saying Something in Alpinist Magazine wins Bronze in Family Travel, Solas Awards The Solas Awards are an annual competition to find the best writing being done about the world today. The Travelers’ Tales editors choose winners in 20 categories ranging from adventure to humor, from destination to memoir, and everything in between. Winter 2017: Leslie named “a Force of Nature” and “badass” by Misadventures: the Adventure Magazine for Women. September 28, 2017: Why Adventure Travel is Good for the Family in Conde Nast Traveler. August 25, 2017, 6:30pm: Join me for free tacos and beer! Hear a sneak peek of forthcoming work. I’ll raffle off Patagonia and other brands that I test along with my mother’s wildlife artwork. Keynote speaker for REI’s #ForceofNature campaign. Register for free. July 2017: 5 Nutrition Myths That No Hiker Should Believe in Backpacker Magazine. June 3, 2017: Leslie speaking about “Travel Writer as Cartographer” and “Third Culture Point of View: Writing from a Multicultural Perspective” at NonfictioNOW. March 1, 2017: “Warp Thread” wins Bronze in Family Travel category of 2017 Solas Awards sponsored by Travelers’ Tales. February 2017: Leslie’s work is named in 5 categories of the North American Travel Journalist Association’s 2016 Travel Media Awards. January 8, 2017: “I tried the Chinese practice of ‘sitting the month’ after childbirth” Published in Washington Post. May 24, 2016: “AAPI Heritage Month Recap: Champions for Art and Storytelling” on White House Blog. May 13, 2016: “These Chinese-American Women Are the Champions of Change Heroes” on Vision. May 4, 2016: Leslie spoke at the White House as “White House Champions of Change for Asian American and Pacific Islander Art and Storytelling.” Watch recording here. May 2, 2016: “10 Asian American, Pacific Islanders to be honored by the White House for being ‘Champions of Change’” on The American Bazaar. May 2, 2016: “AAPI Heritage Month: White House Honors Artists & Story Tellers” on AsAmNews. May 2, 2016: “White House to honor Asian Americans and Pacific Islanders” on Dallas Morning News. May 2016: Leslie named as “White House Champions of Change for Asian American and Pacific Islander Art and Storytelling.” She was nominated for her leadership and tireless work to raise the visibility of diverse AAPI experiences and create dialogue around issues the community faces. April 30, 2016: “Our founder, Leslie Hsu Oh, named as White House Champions of Change” on Hepatitis B Initiative. April 29, 2016: “Meet The White House Champions of Change For Asian American And Pacific Islander Art And Storytelling” on Asian Angry Man Blog. March 23, 2016: Leslie Hsu Oh joins Panorama: The Journal of Intelligent Travel as a Contributing Writer. They selected 40 out of 6000 applicants! March 9, 2016: Leslie Hsu Oh discusses Phenomenal by Leigh Ann Henion. Published at The Military Spouse Blog Review. February 23, 2016: “How to Enjoy a Family Ski Resort Without Skiing.” Published in Parenting Magazine. January 22, 2016: “Yes, that’s my toddler snowboarding. Extreme sports don’t have to stop when you have kids.” Published in Washington Post. November 24, 2015: Leslie Hsu Oh spoke at George Washington University on “The Untold Story of Hepatitis B.” Sponsored by APAMSA. November 13, 2015: “Important Lessons about Giving from Alaska: The More You Give, the More You Get Back” published in TODAY Show Parenting Team. October 2015: “The Right Mask” published in Alaska Magazine. October 24, 2015: Leslie Hsu Oh and HBI featured in World Journal. July 26-28, 2015: Leslie Hsu Oh invited to Hep B United Summit and World Hepatitis Day events. July 24, 2015: Leslie Hsu Oh featured in Sampan Newspaper. July 16, 2015: SinoVision interviews Leslie Hsu Oh. July 16, 2015: Leslie Hsu Oh speaks at journalist workshop in Boston. June 2015: “Masters and Apprentices” appears with a new ending in Arctic Studies Center’s newsletter. May 31, 2015: Leslie Hsu Oh speaks at HBI-DC 5th Annual Benefit Gala and Awards Dinner. May 12, 2015: Leslie Hsu Oh speaks at Congressional Viral Hepatiits Reception. April 20, 2015: Leslie Hsu Oh interviews Leigh Newman at 49 Writers. March 2015:Oh family featured in Greenbriar Flyer, Girl Scout and Boy Scouts. November 2014: “Tail End Clearing of the Pathway to the Light: Alaska’s first certified Tribal doctor (cover story)” and “Engaging Our Youth: Smithsonian Pilots New Program at Inuit Studies Conference” and “Losing Everything We Stand For” featured in National Library of Medicine’s Native Voices Exhibit. August 13-23, 2014: Leslie Hsu Oh invited to attend Bread Loaf Writers’ Conference. Reading @ Blue Parlor. Spring 2013: “Warp Thread” published in Fourth Genre. 2013: “Love Food” accepted in anthology titled Tao of Parenthood. February 2013: Leslie Hsu Oh teaches Nonfiction Apprenticeship for 49Writers. February/March 2013: “Breaking Conventions: How the Smithsonian’s Arctic Studies Center Makes a Difference” published in First Alaskans Magazine. 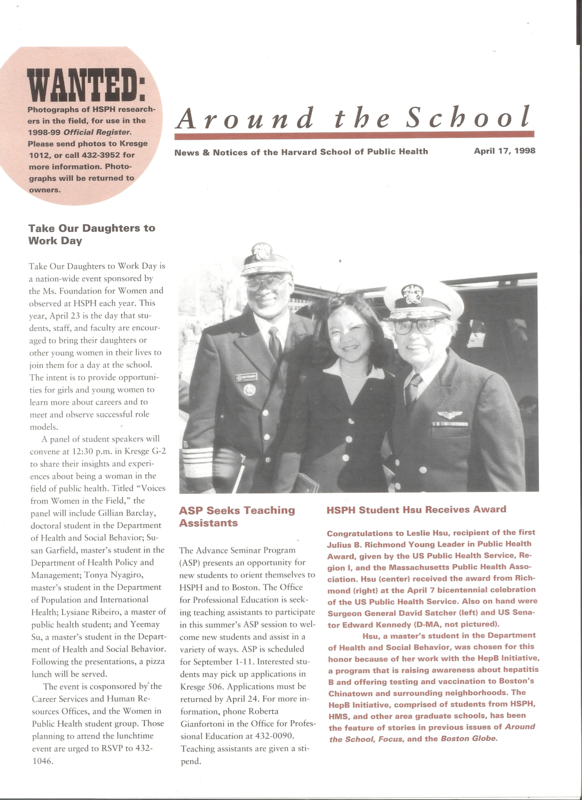 February/March 2013: “Engaging Our Youth: Smithsonian Pilots New Program at Inuit Studies Conference” published in First Alaskans Magazine. December 2012/January 2012: “Giving Outside the Box: Traditions of Giving and Living a Good Life” published in First Alaskans Magazine. December 2012/January 2013: “This Thing That Happens: How to Remove Grief” published in First Alaskans Magazine. August/September 2012: “Quiet in my Arms: Scholars find ways to respectfully preserve oral traditions” published in First Alaskans Magazine. April 2012: “Mooncake” (poetry) forthcoming in Stoneboat. May 2012: One of my students from the 49 Writing Center class I taught in October just published an essay we worked on together in Alaska Magazine. January 2012: “Mother for her People” and “A Dogmusher’s Secret” published in First Alaskans Magazine. October 23, 2011: Introduced Dr. Howard Koh, the Assistant Secretary for Health at the US Department of Health and Human Services, at HBI-DC‘s Benefit Gala and Award Dinner. August 8, 2011: Leslie Hsu Oh teaches at Anchorage School District Advanced Academy: Writing Institute. 2011: New edition of The Whale of A Boy by Auxilia Hsu, which was translated from English to Chinese and published originally in 1995, includes a new foreword written by Leslie Hsu Oh. November 1, 2010: Leslie founds Love + eMotion Blog launched at Kids These Days! Spring 2009: “Love Food” published in Rosebud Magazine along with new poems from Alice Walker, unpublished lyrics from Jim Morrison, and a new story by W.P Kinsella (the author who wrote Field of Dreams). 1999-2001: The Office of the Surgeon General highlighted a number of community and state programs that supported important priorities as models for action. HBI-Boston was one of five listed as a model program on Surgeon General’s Web site. May 20, 1998: Leslie Hsu and Gina Cobin writes “The Partnership of Traditional Navajo Medicine and Biomedical Health Care Practices at the Chinle Comprehensive Core Facility” for the Role of Traditional Navajo Medicine Committee at the Chinle Comprehensive Health Care Facility, funded by the Harvard University Native American Program Nation Building Project. February 15, 1998 : “Q&A with Leslie Hsu, South Cove Health Center in Chinatown” in The Boston Globe. “The Couple in Trouble” published in Outside Magazine won gold in the 2018 NATJA Travel Media Awards Destination Travel online category (2019). “A Guilt-Free Day on the Slopes: One adventurous family’s guide to the latest in ecofriendly snowboarding gear” originally published in Sierra Magazine won gold in the 2018 NATJA Travel Media Awards Eco, Environmental or Volunteer Travel category (2019). “The Couple in Trouble” published in Outside Magazine won silver in the 2018 NATJA Travel Media Awards Health and Wellness Travel category (2019). “Snags” originally published in Panorama Journal of Intelligent Travel won silver in the 2018 NATJA Travel Media Awards Cultural Travel online category (2019). “Snags” originally published in Panorama Journal of Intelligent Travel won Honorable Mention in the 2018 NATJA Travel Media Awards Long-Form Narrative category (2019). “K’e yil yal tx’i: Saying Something” published in Alpinist Magazine wins Bronze in Family Travel category of Best Travel Writing Solas Awards The Solas Awards are an annual competition to find the best writing being done about the world today. The Travelers’ Tales editors choose winners in 20 categories ranging from adventure to humor, from destination to memoir, and everything in between (2018). “Warp Threads” in Fourth Genre, Spring 2013 wins Bronze in Family Travel category of Best Travel Writing Solas Awards sponsored by Travelers’ Tales (2017). “W.Va.’s ‘island in the sky’ hosts pristine trails for skiing and snowboarding” in Washington Post Travel, Finalist in Destination Travel, Domestic Newspaper, 2016 North American Travel Journalist Association Award (2017). “Yes, that’s my toddler snowboarding. Extreme sports don’t have to stop when you have kids.” in Washington Post, Silver in Intergenerational and Family Travel and Finalist in Sports, Recreation, and Adventure 2016 NATJA Award (2017). “How Canoes Are Saving Lives and Restoring Spirit” in Smithsonian Magazine, Silver in Local Lifestyle & Bronze in Cultural, Educational, Self-Improvement Travel, 2016 NATJA Award (2017). “The Right Mask” originally featured in Alaska Magazine wins Honorable Mention in Magazine Feature Writing, 85rd Annual Writer’s Digest Competition (2016). Leslie Hsu Oh named White House Champions of Change for AAPI Storytelling and Art (2016). Prior to 1997: Member of UCLA Student Honors Program, Mortar Board, Golden Key, Alpha Lambda Delta. Distinguished Scholar Award, McDonnell Douglas Scholarship for leadership and academic achievement (4yrs), UCLA Alumni Association Achievement Award (3yrs), Rose and Sam Gilbert Honors and Bette Don Prell Honors Scholarship. 2018: Leslie selected as media delegate by Adventure Travel Trade Association for their AdventureNEXT NearEast conference. March 2015: Ethan Oh wins first place in Pinewood Derby. 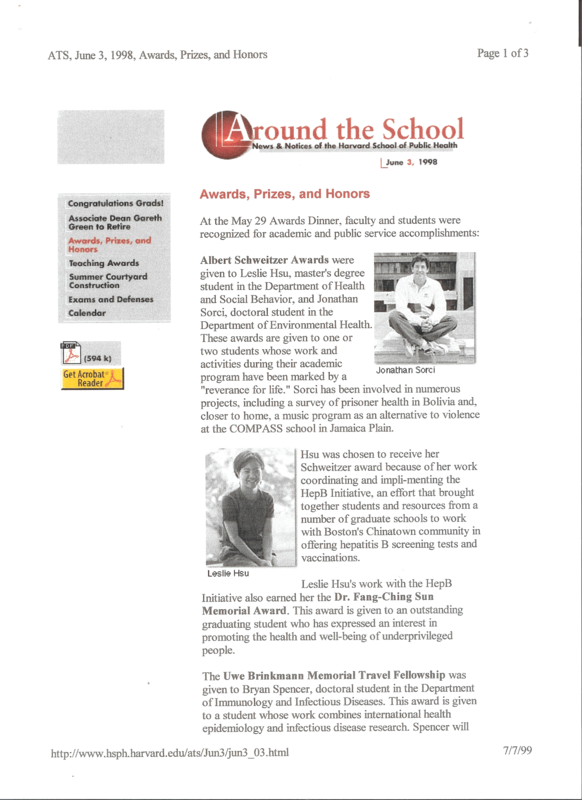 Leslie Hsu Oh and Thomas Oh featured in Greenbriar Flyer. August 3, 2001: “Hepatitis B, A Disease for the Generation Next” in The Rafu Magazine, Volume III, Number 19. 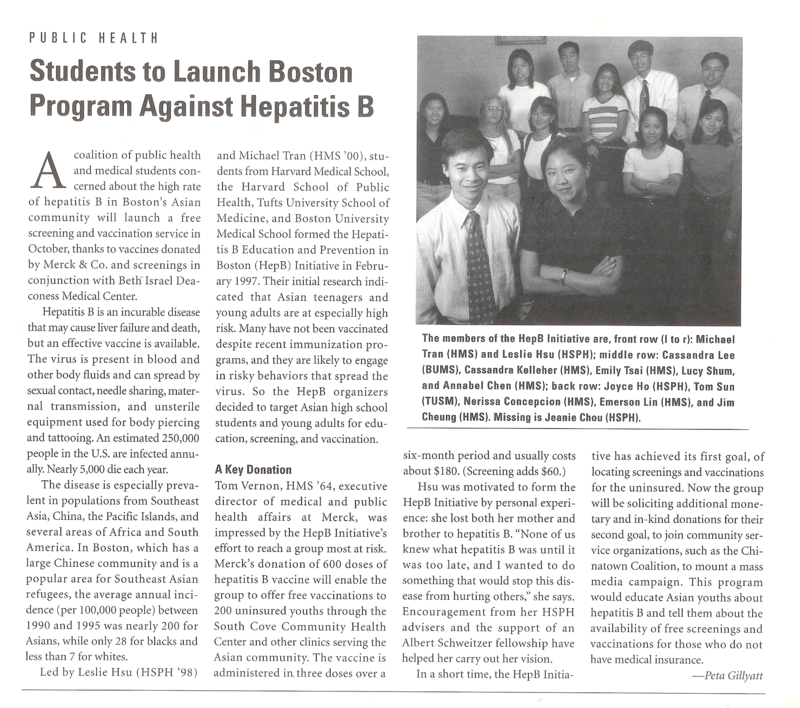 February 15, 1998 : “Q &A with Leslie Hsu, South Cove Health Center in Chinatown” in The Boston Globe.